Join a sausage making workshop and experience the best eats Europe has to offer at exclusive activities happening in-store. Learn more here. Sausage or wurst is a quintessential component of the country’s cuisine and the Germans’ way of turning food scraps into something delicious. When in Germany, sausages are not just for breakfast but can be enjoyed any time of the day. Other than being a main meal, sausages are often incorporated in soups, stews, and casseroles. They are also a staple during important occasions such as Christmas and Oktoberfest. Wurst is essentially made from pork, fat, and spices but Germany has over a thousand varieties worth trying out. Some sausages have even earned the Protected Geographical Indication (PGI) status, one of the European Union’s schemes that aim to protect the quality of regional food and agricultural products. Different German regions may be producing their own sausages, but these can be grouped into three main categories: raw, precooked, and cooked. Roh means raw in German. 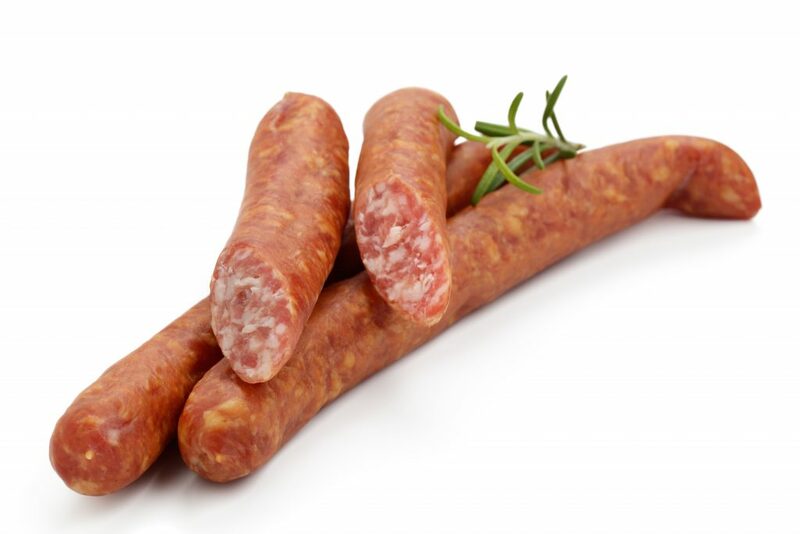 This type of sausage is usually made of raw high-quality pork and beef combined with bacon, spices, and curing agents. Formed raw sausages are then smoked and fermented or simply dried to develop their flavour and make them safe for consumption. There are two types of rohwurst available: the soft, spreadable variety with a short shelf life, and the firm, sliceable variety with a longer shelf life. Below are a few examples of raw German sausages. Smoking mettwurst for a longer period results to a firmer sausage that’s great in soups and stews. Wurst fact: “Tee” means tea in German; thus, this sausage is usually eaten at teatime. Today, teewurst is also available in bottled containers rather than sausage skins. Wurst fact: “Mett” translates to minced pork without bacon. 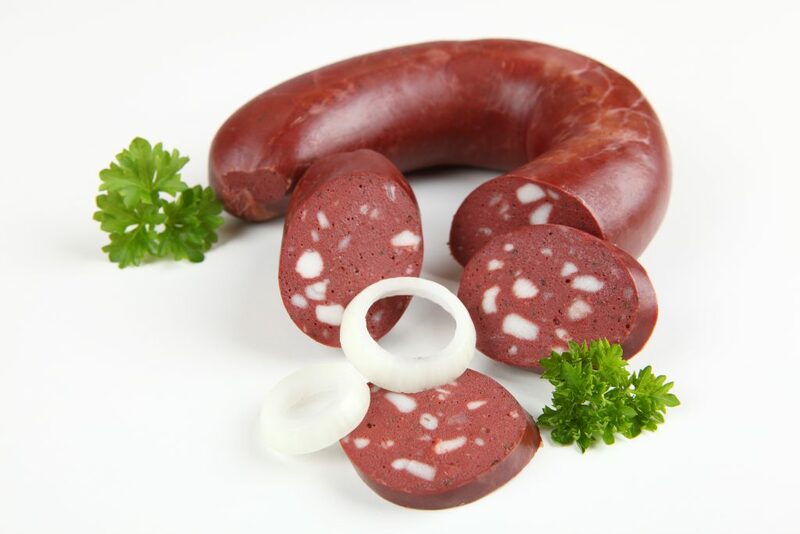 Wurst fact: Landjäger is flattened during fermentation for its distinct rectangular shape. From the German word bruhen, which means to scald or blanch, bruhwurst is a variety of sausage that is boiled or precooked in steam or hot air. These wursts are cooked to a certain temperature to make them edible. Because of this cooking process, these sausages develop an outer skin with a bite that remains even when they are reheated. 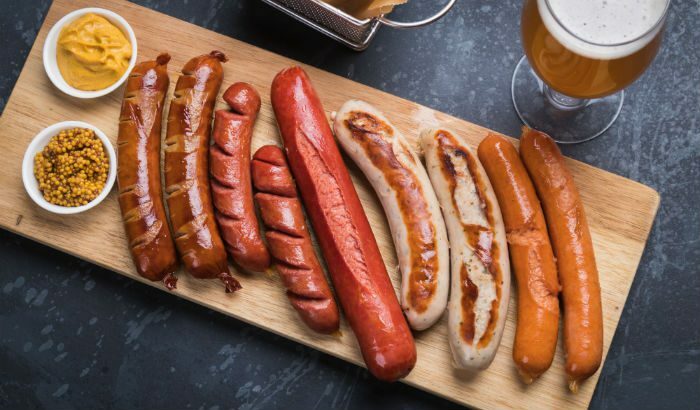 Here are some popular bruhwursts that you are likely to encounter on your next trip to Germany. 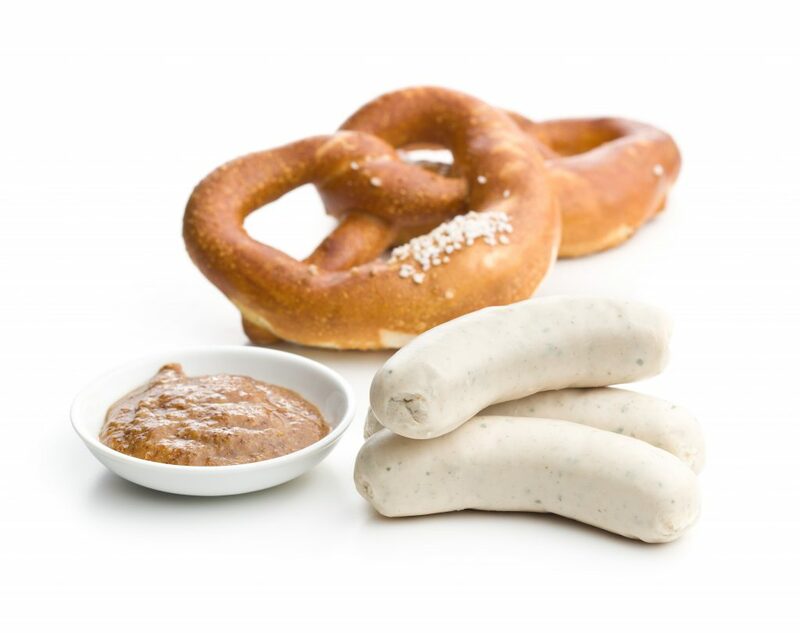 Weisswurst’s perfect match? Mustard and pretzels! Wurst fact: This hot dog lookalike originated in Frankfurt; thus, it’s also known as a frankfurter. Wurst fact: “Gelb” means yellow in German, which is the colour of the gelbwurst’s casing. This sausage was once called hirnwurst as it traditionally contained 25% pig’s brains—a practice that’s no longer done today. Wurst fact: It was said to be invented by mistake when an innkeeper ran out of sheep casing for sausages and used tough pork casing instead. He boiled the sausages for fear that they might split on the grill. Today, cooked weisswurst meat is sucked or scooped out without eating the casing. Kochwurst is derived from the term kochen, which is the German word for cooking. Sausages under this group contain cooked meat and offal mixed with binders such as gelatine, blood, or cereals. The mixture is then stuffed into casings then cooked, cured, or smoked for more flavour. Below are some familiar German cooked sausages. In Cologne, blood sausage is served with mashed potatoes and applesauce—a dish called himmel und erde (heaven and earth). Wurst fact: Liverwurst is spreadable due to its high fat content but is also rich in vitamins and iron. The best varieties of this sausage contains over 25% liver. Wurst fact: Sulzwurst is a type of headcheese or meat jelly, similar to a terrine. It’s name was derived from the German word sulze, which means brawn. Wurst fact: In East Germany, blutwurst is usually mashed then cooked with onions and bacon. The dish is popularly known as tote oma (dead grandma) or verkehrsunfall (traffic accident). You might be wondering which group Germany’s most popular sausage belong to. Bratwurst is of its own variety as it can be purchased raw or precooked. Raw bratwurst is usually pink in colour and may require some skill to cook properly. Some would boil it for a few minutes in water before grilling to make sure it’s fully cooked inside. The precooked bratwurst, on the other hand, is pale and stiff in appearance. It has a longer shelf life and is easier to grill. Different German regions have their own take on this famous sausage. Any kind of meat, from pork to beef to lamb to venison, can be used to make it. 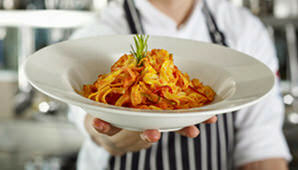 It also comes in all sorts of sizes, textures, and flavourings. Among the most prized bratwursts are the Thuringer rostbratwurst, flavoured with marjoram and caraway, and the Nuremberg bratwurst, spiced with garlic, peppercorns, and marjoram. These regional sausages are protected by law; thus, they can only be made in the cities where they originated. Learn a few wurst facts and understand what makes each type unique with this guide featuring some of Germany’s well-loved sausages.